Circus people are abundantly superstitious and have long lists of Big Top fetishes: Don’t whistle under the Big Top. Enter the ring right foot first. Carry an elephant hair in your pocket. When you’re on parade, never look back. That sort of thing. It’s a wonder that an old circus man like John Robinson built an Opera House with 13 windows on each floor. What was he thinking? “Uncle” John Robinson certainly knew about circus superstitions. He was the founder of a circus dynasty that lasted four generations from 1842 to 1911. The John Robinson Circus was based in the West End and later in Terrace Park. 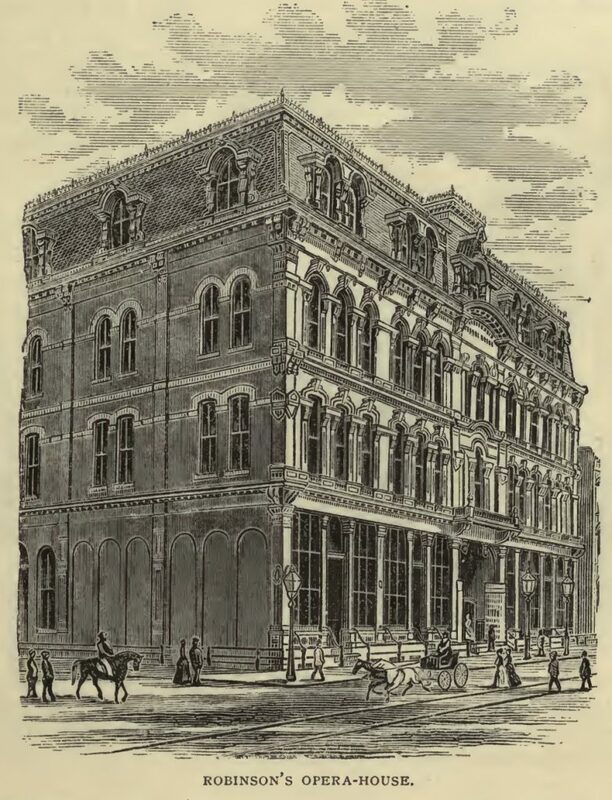 Examine the second and third stories on the Plum Street side of Robinson’s Opera House. Each has 13 windows, and that means hoodoo, said the neighbors. On Monday, amid reports of funerals and inquests, newspapers ran heart-breaking inventories of recovered items available for claim at the Opera House, including shoes, shawls, overcoats, galoshes, hair switches, gloves, veils, handkerchiefs and hats. 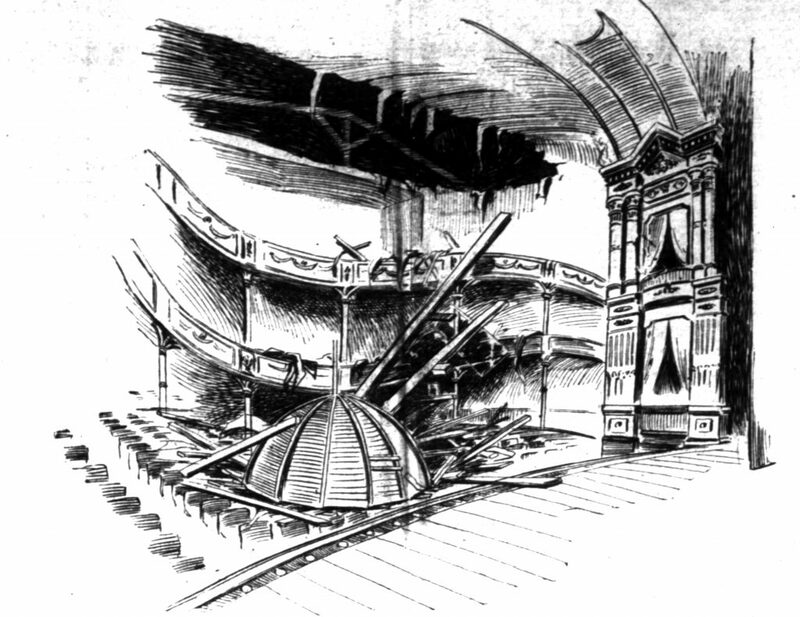 A large dome, positioned over the orchestra seats, fell from the ceiling. The theater was plunged into darkness and the audience scrambled over debris and bodies to locate any exits, and then the remainder of the ceiling fell onto the seats below. Five people died – an amazingly light mortality roll given the theater’s capacity. Another 25 or more suffered serious injuries requiring medical attention, among them broken limbs, skull fractures and internal hemorrhaging. The distinctive dome of Robinson’s Opera House fell into the auditorium in 1897, dragging most of the ceiling with it. It didn’t work. Robinson’s Opera House never regained its audience despite sporadic announcements of promising acts. The ground-floor restaurant and several floors of offices remained occupied, but the vast auditorium sat idle. And the jinx was still active. In 1910 a team of safecrackers used nitroglycerin to blow a safe in one of the offices and made off with $1,400 in bills and bags of coin. During the Great Depression, the Opera House became a flophouse and a soup kitchen, attracting lines of unemployed men instead of fashionable patrons.